Force closure is a biomechanical myofascial system that helps to produce a “self-locking” mechanism for joints. It occurs when contraction of the muscles/fascia that cross a joint results in increased stability of the joint. This external dynamic myofascial force can increase stability by producing a closed pack articular position (increased congruency), generating segmental stiffness, and increasing compression perpendicular to the joint. Shoe laces provide force closure of the foot in the shoe. The Posterior Oblique Sling (A. Vleeming, D. Lee, P. Chek) or Back Functional Line (T. Myers) consist of the latissimus dorsi, posterior layer of the thoracolumbar fascia, and the contralateral gluteus maximus. This sling/line runs from the intertubercular groove of the humerus to the contralateral tibial tuberosity. It is an important component of force closure of the Sacroiliac Joint. Vleeming et al 1995 found that activation of the LD and contralateral GM creates a force perpendicular to the SIJ. Along with force closure of the SIJ, it functions to assist with proper load transfer between the spine, pelvis, and legs. Andrew Vleeming has advocated the training of the gluteus maximus, latissimus dorsi, and erector spinae muscles to assist in force closure of the SIJ and stabilization of the lumbar spine. Has an axial origin at the iliac crest, lumbar vertebrae, lower thoracic vertebrae, and thoracolumbar fascia and inserts into to inferior surface of the intertubercular groove. It also has attachments into the inferior angle of the scapula and inferior 3 or 4 ribs. The LD functions to extend, medially rotate, and adducts the humerus. It can also have synergistic function of anterior tilting the pelvis (lumbar extension) and lateral flexion. 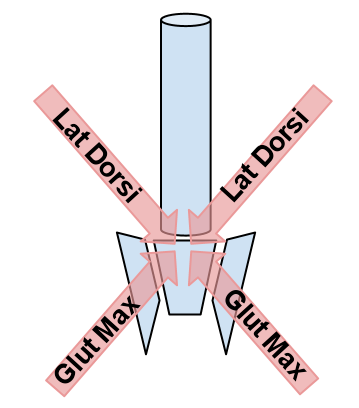 Research has shown that the posterior layer of the thoracolumbar fascia has strong attachments to the latissimus dorsi and contralateral gluteus maximus. Some studies have also showed some smaller attachments into the external oblique and trapezius muscle. Has an axial origin at the posterior aspect of dorsal ilium posterior, posterior superior iliac crest, posterior inferior aspect of sacrum and coccyx, and sacrotuberous ligament. It inserts into the posterior iliotibial band and the gluteal tuberosity on the posterior femur. The GM functions to extend an laterally rotate the hip. The upper and middle third assist in abduction. The deep sacral fibers of the GM play an important stabilizing role and function to assist with posterior pelvic tilt. Utilizing the force closure concept by training the posterior oblique sling/back functional line may help to provide additional stability and SIJ/LBP patients. Of course it is first necessary to assess if the myofascial structure is weak, restricted, or a combination of both. Look for a future post on a strengthening and stretching exercise for this mechanism. Vleeming A, Mooney V, Snijders C, et al. Movement, Stability and Low Back Pain: The Essential Role of the Pelvis. New York: Churchill Livingstone, 1997.